I’ve been teaching grade 6 math for 20 years and it often felt like pulling teeth. I now understand why. I had a very toxic relationship with the textbook. I allowed it to dictate me. I allowed it to control my every move. I allowed it to tell me what to teach and how to teach it. I allowed the text to stifle my creativity, passion and talents and I allowed it to do the same thing to my students. Slowly, over time, I came to this realization. Today, simply put, I’ve ditched the text. EUREKA! Grace was excited to share the the problem that her mom had posed to her. She said, however, that her mom had taught her a new strategy that I may not like. I was loving the direction our math was going already! I was intrigued and so was my class! EUREKA! To add context, on the way to school, I had been wondering if today was the day I should introduce the long and short division algorithms to my class. They had gained an incredible understanding of what it means to divide by working on several RWM questions and coming up with innovative strategies of their own. I thought that today may be the day that I teach them the algorithms to add another (more efficient) tool to their division tool kits. EUREKA! At first we debated whether or not this was even a REAL World Math question (Was it possible that some jeans are priced at $359.00? Do kids make $12.00 an hour).EUREKA! As we were discussing, side conversations about the answer evolved and many kids started working towards finding the answer. I said, “Ok Grace let me see if I can figure out this new strategy your mom has showed you”. I proceeded to do the long division algorithm on chart paper and talk though the solution as I worked. “That’s it!” yelled Grace. “Hey, my mom showed me that strategy with a different HomeSHARE problem too” said Tom. EUREKA! Some others had confirmed they had seen this new strategy as well and they started sharing with one another their understanding of it. “I don’t get it!” yelled another student.”Neither do I” chimed in someone else. “Ok, everyone. Based on the information you see in my calculations, how long does Grace need to work to earn her pair of jeans?” The consensus was 29 hours. However, a few students who had proceed to work on the problem with their own strategy and were thinking that somehow it may be 30 hours that Grace would have to work. Some were adamant it was 30 hours! EUREKA! “What’s the 11?” inquired one of my grade 5s. “That’s just ‘left over’ and it doesn’t really matter” thought someone out loud. EUREKA! “Ok, kids” I said. Do we all agree that Grace needs to work around 30 hours to earn the $359.00 pair of jeans? Each one of them were in agreement on that and stated that they could prove it. EUREKA! At this point our French teacher had entered the room and the conversation still continued. “So, boys and girls” do we like Grace’s new strategy? Some did. Others didn’t. Many were on the fence but wanted to learn more. “Do you like the strategy, Mr.C?” asked one of my students? “Sometimes” I replied. EUREKA! Eventually, the kids left for French. We’d have to continue later. I proceeded to the office with chart paper in hand and posed the question to our secretary and principal. I then entered the staff room and wrote the question on our white board.From there, I proceeded to use SMART Notebook to “make” the question. I figured the kids would like if I added the real price to the price tag. I printed the question so the students could add their work to their math portfolios when completed. I placed the question on each student’s desk and then tweeted our new math investigation and tagged some of my closest friends. EUREKA! When my students returned they were eager EUREKA! to get back to their new math challenge and were even more excited to see that other classes throughout the world may join us in our investigation.EUREKA! At this point I wanted to understand where each student was “at” in their math thinking, so I asked them to work independently on their solution as they shared their solution on paper. First Nutrition Break came quickly after 20 minutes. It was difficult to get most of the kids to leave the problem EUREKA! and many of some of them brought their math with them. EUREKA! It was time for a break! I popped by the office to drop the question off to Mr. Grant, our principal and invited him to join us at 12:05 as we were going to continue to work on the problem. I entered the staff room to find that many staff members had contributed to finding a solution to our problem. EUREKA! It was interesting to note that I did not see the traditional algorithm used. EUREKA! I was happy that the first 40 minutes of our second block was DPA (the kids needed it and so did I). We stretched, ran, did sit ups, push ups and jumping jacks, played out favourite game of dodge ball and chilled on our play equipment. After a good brain break, the kids were ready to continue with the problem. EUREKA! As they had all now gotten most of their math thinking onto paper, I now invited them to share their work with a partner if they wished or they could also elect to continue to work independently. As I circulated to listen to math talk, question and push, I confirmed that all students had a strong sense of the problem EUREKA! and knew that Grace would need to work between 29 and 30 hours to earn her jeans.EUREKA! Since Mr. Grant couldn’t join us, he email us his solution. EUREKA! What they were all struggling with was at exactly what time would she earn them? 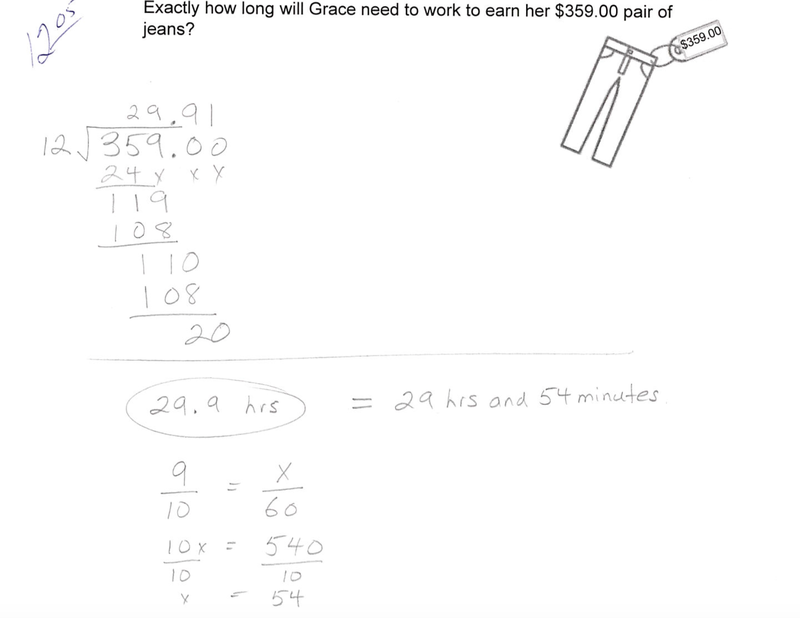 Regardless of the many strategies they had used each of my students had arrived at a “remainder”, which was 11 if they decided Grace needed to work 29 hours or 1 if they decided Grace needed to work 30 hours. This is where they were “fuzzy”.EUREKA! I wasn’t surprised, even though parts of a whole, fractions, decimals, and percents had been explored in some of our previous math investigations and during some DPA activities. I let them continue to struggle, discuss and question. As I gave them time, many students did come to the understanding that the “11” or “1” represented a part of a whole. Some started to realize that the 11 could be represented as a fraction 11/12. Others began arriving at a decimal .91. A discussion evolve about what 1/12 of an hour represented. Others were wondering what 10% of an hour was.EUREKA! As much as I wanted to push further, the kids were starting to fade. Their “math brains were hurting”! EUREKA! We had a body break and practised our Thriller dance routine for our Halloween parade and ended the block by doing a read aloud (Paddle to the Sea). Nutrition Break #2 came and went and the students returned to class wanting to continue the math investigation.EUREKA! Instead we did some mindfulness using of favourite guided meditation: “Calm” Before the kids returned to their “home base” desks. I congratulated them on growing their math brains and told them we were going to move on. But before we did I wanted them to turn to the back of their solution sheets and write “I KNOW” and ” I’M STILL FUZZY”.EUREKA! On one side of their page they wrote all of the things they absolutely knew was correct and could prove. On the other side of the page they list what they were still fuzzy about. As much as I wanted to continue to push, it was time to move on. The kids were excited to continue to prepare for their trip to the Galapagos Islands with Joe Grabowski on Monday.